For real excitement, nothing beats a ride over the Silver Lake Sand Dunes. These shifting dunes promise a different terrain every time you visit them. But safety and common sense should top your list before you venture out. All visitors must pay a Silver Lake State Park entrance fee to access the dunes. Tickets are issued by rangers for violation of park rules or unsafe driving practices. Once inside, make sure your vehicle has mounted to the front bumper a ten foot mast holding an international orange flag (sold at area businesses). With the rolling terrain, these flags can help divert a dangerous collision. You must be belted at all times, and drivers with their own vehicles should reduce the air pressure to ten pounds per tire. Because these are shifting sand dunes, keep in mind that the small hill you drove over in the morning could become a dramatic drop off by afternoon. Taking the appropriate steps guarantees you'll have a safe and exhilarating ride over these spectacular sand dunes. 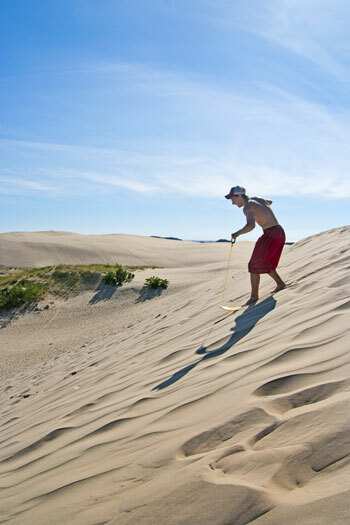 Silver Lake State Park is one of the few areas in the country that users can still enjoy riding freely on sand dunes. Located about 20 minutes south of Ludington, MI these shifting dunes promise a different terrain every time you visit them. Offroading can be fun and exciting for the whole family. Make it a safe experience for yourself and other park visitors. Please follow the rules that have been made for everyone's safety and security. Sand dunes are subject to rapid topographic changes resulting from winds and erosion. Be alert for steep inclines, changing slopes, natural hazards and/or sudden drop-offs. Always operate your vehicle at a safe speed and in a safe manner. There are a number of general rules that apply to all operators using the Silver Lake Off-Road Vehicle (ORV) Area. The DNR, in cooperation with the Silver aLake ORV Area, has announced that they are eliminating permit sales at the ORV area entrance. "Dune-ready" vouchers will no longer be needed if your vehicle can be driven straight from the road to the dunes. You must make sure you have your Recreation Passport, ORV permit and ORV trail permit. Customers may visit the Welcome Center or other locations to purchase the required permits. This will allow a more efficient check-in process at the entrance. The Off-Road Vehicle Area is open each year from April 1 through October 31. April 1 - May 15 and the day after Labor Day - October 31 it is open 9:00a.m. - 8:00 p.m.
May 16 - Labor Day it is open 9:00 a.m. - 10:00 p.m.
Access to the ORV Area and Dunes is stopped 1/2 hour ahead of closing time, every evening. Current vehicle permits are required on all vehicles using the area. The permit price has been raised from $16.25 to $26.25. All motor vehicles entering the Park must display a Michigan State Park Motor Vehicle Permit. In addition, off-road enthusiasts will also be required to purchase a base $10 trail and scramble permit in addition to the Recreation Passport. All motor vehicles entering the Dunes must display a Michigan ORV Registration. Entry Vouchers are required on summer weekends and holidays. No alcoholic beverages are allowed throughout the year in and around the ORV Area. Operate vehicles only within the dune area marked with orange boundary markers. Obey Directional Traffic Zone signage. No north-bound traffic in high dune areas. Rectangular, safety orange flags reaching 10 foot in height required on all ORVs. Michigan Child Passenger Safety Law in effect in ORV Area. Emergency strobe, flashing, rotating and/or blinking lights and sirens prohibited. 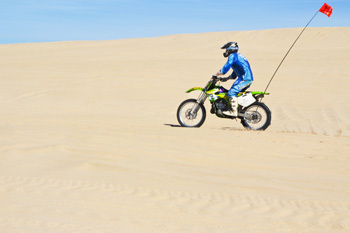 Helmets are required to operate ATVs and motorcycles in parking lot as well as in dunes. Special regulations for unlicensed and young (12 - 16 years of age) operators. Headlight(s), taillight(s) and brake light(s) required on vehicles ½ hour after sunset. ATVs and motorcycles: operator only, no passengers at any time. Please report accidents, injuries and/or emergencies to State Park personnel or 911. 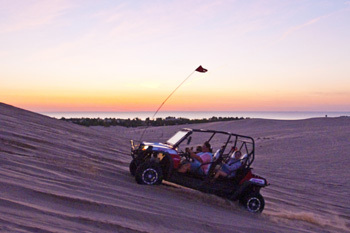 For all the specific rules and requirements for enjoying your Silver Lake ORV experience please visit the Michigan Department of Natural Resources Silver Lake Sand Dunes Area page.